Ok, I had to look up what effulgent meant because I had no idea. You don't know either? Well, apparently it means radiant. And boy, is Effulgent the polish radiant! It's a shiny gold holographic polish with silver flakes. It's more of a tan gold than a yellow gold. I used direct light to show the holo, so in real life you'll see more of the silver finish and flakes. It had a great formula and only needed 2 coats. I wasn't 100% sure, but Kitakyusha sounded like it would be Japanese. It is, in fact, a Japanese city! I'm not sure how the color is inspired by the city, but it's a dusty holographic polish with tons of silver flakes. This was easily my favorite of the 3. I wore this during the Raleigh Pen Show a couple weeks ago, and I received many compliments from people. I used my light diffuser for this one, so out in the sunlight you will see much more of a holo finish than you see in the pictures. 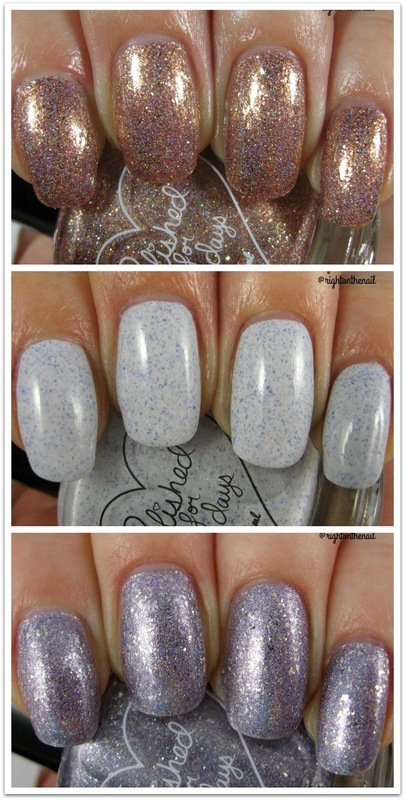 This one applied just like Effulgent and only neeed 2 coats for full opacity. Finally, we have Santorini which is a bright white crelly with blue microflakes. If you don't know anything about Santorini, just Google it, and you will find some beautiful photos. I've always wanted to go to this Greecian island, so I knew I had to get this polish. It's hard to see in my swatches, but there is also a light sprinkling of holo shimmer in there as well. I found the formula to be a bit thicker on this one, so you'll need to be sure to use thin coats. It was also a bit sheerer, so 3 self-leveling coats were needed for full coverage. What do you think? I'm a big fan of the colors I picked, and I'll definitely be ordering again. The polishes shown above all retail for $9 each, but generally the prices retail from $8-$11 each. You can find more information on their website, Instagram, Twitter, and Facebook pages, respectively.